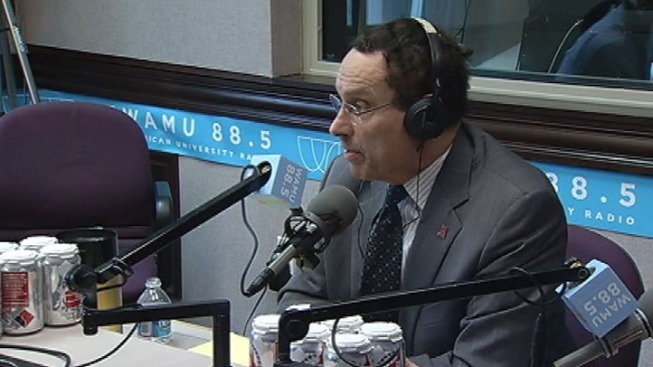 D.C. Mayor Vincent Gray to Launch Re-Election Campaign in Jan.
D.C. Mayor Vincent Gray said on the WAMU "Politics Hour" that he wants D.C. City Council to move ahead on his ethics reform legislation to limit campaign contributions. D.C. Mayor Vincent Gray will launch his re-election campaign next month at a southeast Washington arts and recreation center, his campaign manager announced Friday. The campaign kickoff will be held at noon on Jan. 11 at the Town Hall Education Arts Recreation Campus (THEARC). THEARC is home to several cultural, educational and social service programs that help underserved children and adults east of the Anacostia River. Gray announced his bid for re-election earlier this month after many wondered whether an ongoing federal investigation into his 2010 campaign would keep the incumbent out of the race. "There are lots of people who want to help ... who have prevailed upon me to do this, have even had events at their homes urging me to run for re-election. I really think that people feel the city is going in the right direction," Gray told reporters after signing up for petitions at the D.C. Board of Elections office. Nearly a dozen other Democrats have announced their candidacies, including four current council members; Tommy Wells, Vincent Orange, Jack Evans and Muriel Bowser. All candidates have to turn in 2,000 signatures by Jan. 2, 2014. The investigation is continuing, and as recently as last month Machen said it is still active. Sherwood's Notebook: Gray's In -- Now It Really Begins! But Gray himself has not been charged with wrongdoing. And he is also running a city that is growing and prosperous -- when it was flush with surplus money last fall, the New York Times called it the "healthiest economy of any major metropolitan area in the country." He's also credited with continuing education reforms, begun under his predecessor, that led to the D.C. public school system outpacing the 50 states in improvement for math and reading test scores.